UPDATE on July 12 Five more marriages were held in July. We had talked about the three marriages at the end of this post. Two additional marriages include that of Sweta Bhattarai, Prakriti Shrestha. Mithila Sharma married Motilal Bohara in an un-announced event among close friends only. Sweta Khadka marries Shree Krishna Shrestha and Diya Maskey marries Anup Baral in public functions, Sweta Bhattarai marries Milan Sapkota secretly and another unannounced marriage was that of Prakriti Shrestha and Sudeep Neupane. UPDATE on June 27 Richa Singh Thakuri married to an Australian NRN, Gajendra Thapa, on Ashad 6 (June 20). The news about their marriage was released a few weeks earlier. The daughter of late director Shiva Regmi got married in January, a month after her father’s death. The marriage of ‘So Simple’ actress was a low profile marriage in family mourning the death of her father. We don’t know the exact date of this marriage between choreographer and dancer Shankar BC and singer Nisha Sunar. The couple shared their secret marriage photo in February 2014 right after Nisha went to USA. In the USA, Nisha also gave birth to a child within a month of the marriage announcement. Shankar has a family of his own in Nepal and it was the third marriage of Nisha. The marriage doesn’t make much as Shankar is living in Nepal and Nisha living in USA. A month after the birth of the child, Nisha has started working in a restaurant in the USA. The actress daughter of late director, Shiva Regmi, Bhawana Regmi has got married today. Shiva Regmi had died on December 9, 2013 after failing to recover from kidney failure. The reason behind the marriage in a hurry is not known. According to Hindu tradition, events like marriages are not held in a home for a year when somebody dies. The reason behind the marriage of the daughter within two months of the death of the father is not not known. Samyam Puri – son of director Narayan Puri started in movies as a child artists and had debuted as an adult actor in ‘Samaya’. Salon Basnet – son of actor and director Shovit Basnet is also debuting in ‘Hostel’. To take advantage of Dashain festival, the Shiva Regmi movie, ‘So Simple’ is going to be released on October 19, 2012. Dashain holidays start on the same day. Dashain being the largest festival having the longest holiday in Nepal, every movie try their effort to release in that time. We can expect more movies to release on the date. Nepali director, Shiva Regmi, was Born in 2021 BS (1965 AD) in Baraghare of Chitwan, Nepal. 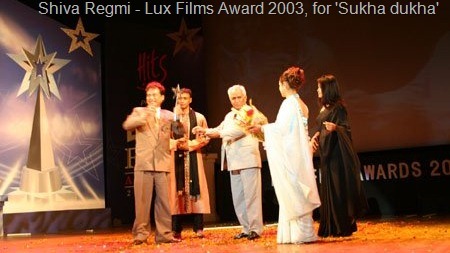 Regmi is a well known Nepali film director, producer, and script writer. Shiva Raj Regmi is the eldest son of Late Khaga Raj Regmi and Bhakta Maya Regmi. He married Gyanu Regmi in 1985 and they have four children – Samjhana Regmi, Bhawana Regmi, Abhishesh Regmi and Pallabi Regmi. His daughter Bhawana Regmi is debuting as an actress in an upcoming movie ‘So Simple’, directed by Shiva Regmi. Shiva Regmi has directed a number movie including the 2012 release ‘Phool’ (xnepali review of Phool). After Keki Adhikari (director Badri Adhikari’s daughter) another director daughter, Bhawana Regmi (director Shiva Regmi’s daughter) is debuting as a lead actress in a movie under her father’s direction. Bhattarai, Rashmi Bhatta, Nirmal Sharma etc. in main roles.